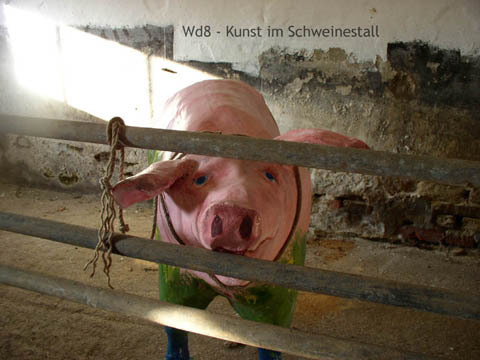 Wd8 is an art center in an old farm in the municipality Ottendorf an der Rittschein in East-Styria in Austria. The name was derived from the address of the center, Walkersdorf 8. The center was initiated by net artist cym. The center offers local and international artists the possibility to spend some time at the old farm and to realize art projects at the venue. The projects in the art center are always strongly connected to the old building and to the village and its residents. The projects balance on the border between real and virtual. The polyester pig made by Belinda Ziegler in the Wd8 pigsty. This website uses third party advertisements to support the site. Some of these advertisers may use technology such as cookies and web beacons when they advertise on this site. You can choose to disable or selectively turn off our cookies or third-party cookies in your browser settings.